As previously stated, beyond the mechanics of the train and bus transportation, this transportation hub has long been a sorry expanse of uninviting concrete. Our group wants to include and move beyond the multi-modal transportation aspect of the hub (for more on the idea, see Project for Public Spaces, From Place to Place: Shifting the Transportation Paradigm with Placemaking). If the point of transportation planning is to get people places they want to be, then all transportation planning should really start with placemaking. We see an opportunity to create an aesthetically inviting destination, a place where people would enjoy spending some time, and a place that would add value to the business district of Milwaukee and Kedzie Avenues. One way to do that is to create a park at the station. 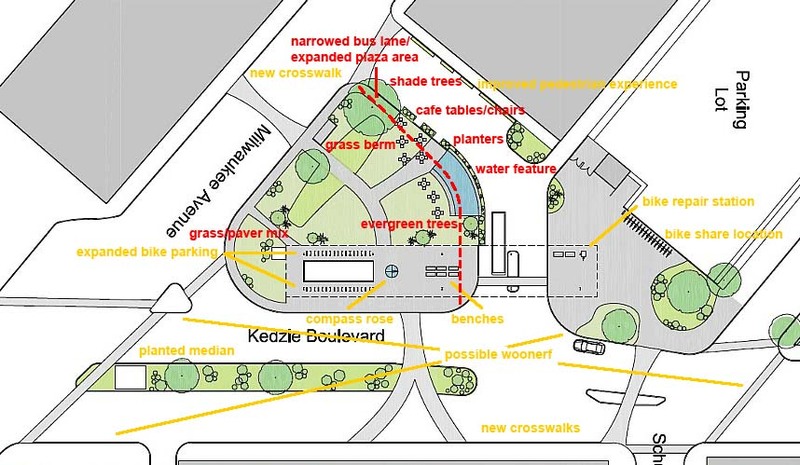 In addition to the suggested improvements to various transportation modes and access to the station (see Improving multi-modal access and experience at the Logan Square transportation hub), in order to achieve the idea of a park at the station, we propose additional changes mainly focused on what is the current “plaza” area to the west of the station canopy. Starting at the top of the image above (click on image to enlarge; north is to the right), we propose to expand the plaza/park area by narrowing the bus lanes. Currently there appears to be capacity for four buses side by side, but only two buses, the eastbound and westbound 76/Diversey buses, pick up passengers here and rarely side by side. At one time another bus line used the station, but that is no longer the case, so we would like to capture some of that unused asphalt bus lane to expand the plaza/park area to make it a more attractive place. Like with the sidewalk to the north of the bus lanes, planters could be used to form a barrier between the buses and the people enjoying the plaza/park (see, for example, photo above of a multi-section planter that would invite climbing plants). While there have always been trees planted at the station, at least in recent years they’ve been in various states of, well, dead or dying. 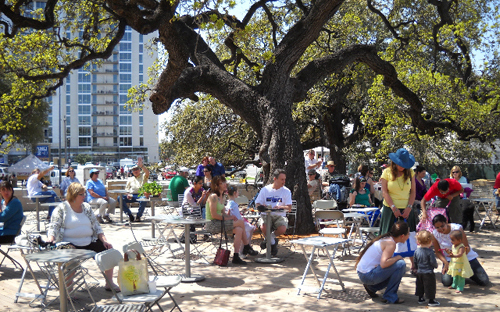 We would like to see some trees planted in a manner that would give them a chance to mature and provide shade to the plaza/park (see, for example, photo above). Then we’d like to see some café tables and chairs where people could sit and enjoy the plaza/park, enjoy carry-out food from a local restaurant or from a street vendor. Another great people attractor and place activator is water. People like to look at it, touch it, and even hear it, so our park concept includes a shallow water feature (see, for example, photo left). We suggest that it be separated from the bus lanes by planters and lined with a bench on the plaza/park side so people can dip in their toes. East of the water feature and west of the canopy, we propose to plant some evergreen trees in clusters. These would add some winter interest to the plaza/park. These would have the added benefit — one I should have mentioned in the discussion about Improving multi-modal access and experience at the Logan Square transportation hub — of providing some protection from the wind for waiting bus passengers. 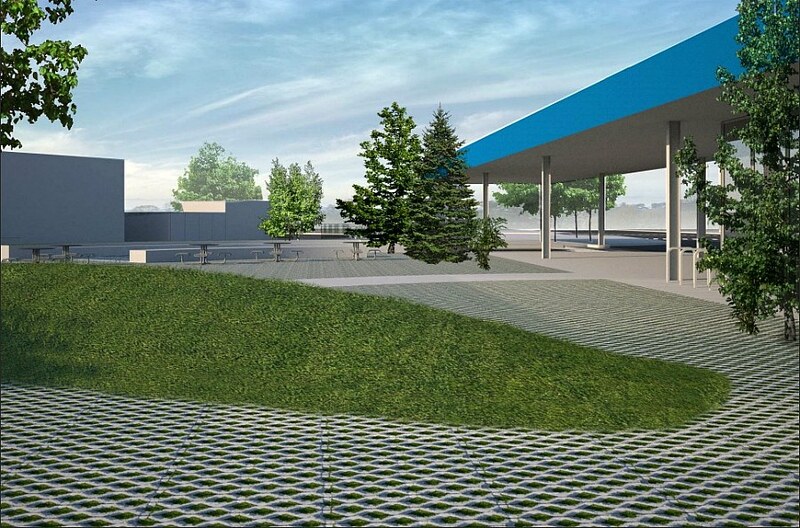 Also, to add some dimension to the plaza/park, we envision a low grass berm along Milwaukee Avenue that would be separated by a path to the Milwaukee Avenue bus stop (see, for example, photo right from Zach K on Flickr). The berm itself would serve as a barrier between moving traffic on Milwaukee Avenue and people enjoying the plaza/park. We think children waiting for the bus or who made the plaza/park the destination also might find it entertaining. And it would also provide some additional seating, if, for example, someone wanted to sit and read a book. Finally, the surface of the plaza/park itself would be mostly a mix of grass and pavers (see, for example, photo left of a grass/paver mix). 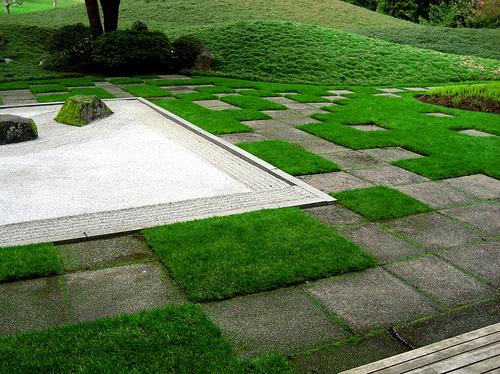 Paths of a smoother surface would cut through the grass/paver mix to provide accessible paths and ones that can be cleared of snow in the winter. 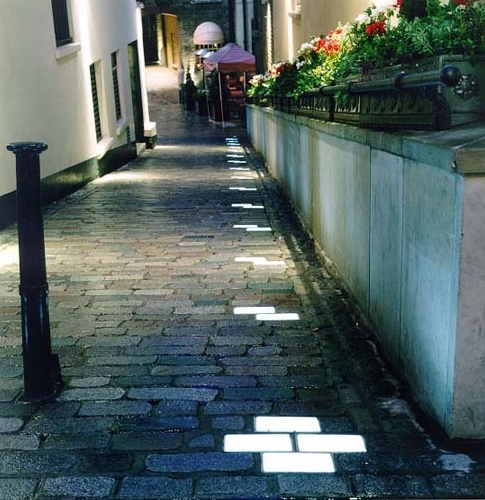 We’d also like to introduce some accent lighting, perhaps right along side the pavers (see, for example, photo left of paver lights). Picture yourself in this plaza/park (see image below). What components do you like? And what’s missing? This entry was posted on Thursday, September 1st, 2011 at 12:29 am and is filed under Logan Square, Milwaukee Ave..	You can follow any responses to this entry through the RSS 2.0 feed. You can leave a response, or trackback from your own site. Looks Great! I like the idea or narrowing the bus entrance to create additional green space. Have you considered enclosing part(s) of the bus shelter for lease able vendor space? I would also like to see a planted median extend up Kedzie north to Diversey to tie the street into the Boulevard and safer crossing for pedestrians. I’d like to mention this on Time Out Chicago’s “Out & About” blog, and I would love it if you could send me a copy of the top image that I could run along with — would you email me at rwelte at timeoutchicago dot com? I can’t find any contact info for you here. I like almost everything about it plan. Nice work, friends. The things I don’t like are just personal. I would also like to see a planted median extend up Kedzie north to Diversey to tie the street into the Boulevard and safer crossing for pedestrians. the lack of niches and shade along with the expansive lawn makes this feel more like a playing space than anything else, which is probably not the type of activity desired in this corner. this plan doesn’t seem to divert in concept from the currently underwhelming boulevards in the area. just provide some intimate and more adequately-scaled spaces, which to me, feel more like logan square. i do like some of the functional gestures as the narrowing of the driving lanes, the bicycle repair station (barring location), berm, plated median, and the new crosswalks. 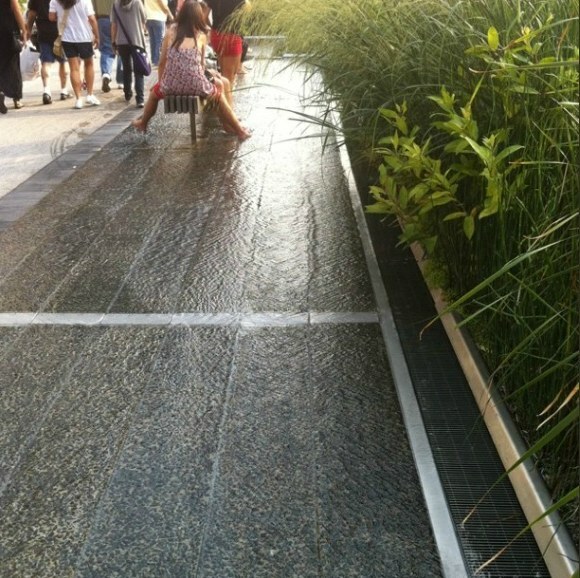 the water feature is just kitsch as a necessary element of a plaza. this plan is a good step forward and feels ready to be turned over to a design firm. Wow! This would truly transform that intersection in a way that brings beauty, life and energy to the plaza! What a fantastic idea! I am going to disagree with this basic premise of the project, but suggest some alternative premises. My knowledge of this station is that it is my regular evening stop transferring from the Blue line to the 56 Milwaukee Bus north. While aesthetically inviting is certainly superior to ugly, it is unclear to me that there is a neighborhood need for making this a destination where people spend some time. It is adjacent to Logan Square, which holds plenty of destination space. On the other hand, there are some deficiencies in how the current space supports human behaviors central to a transit stop; a re-visioning of this space should understand those deficiencies and work to address them. 1. The commuters moving from the Blue line to the two Montrose busses informally queue up to embark on those buses. Currently there is no signage to explain that there are two different Bus 87 Montrose routes, and the non-regular commuter may not realize this . But drivers must verbally explain this each trip; inevitably, some rider embark on the wrong direction 87 bus. In addition, there is no structured support for queueing. A design solution that would support these human behaviors should visually or spatially communicate the differences between the two 87 bus routes. Further, a solution should structurall support ordered queueing and cue the non-regular commuter to this queueing behavior. 2. Commuters waiting for the 56 Milwaukee bus north are unable to wait under the blue covered platform as the approaching bus is hidden to them from that angle. They must move across the park and squeeze into the small bus shelter (in inclement weather.) The location of the escalators and large shelter was incorrectly positioned for this requirement and is likely too costly to relocate. However a solution that supports more effective movement from the escalators to the 56 shelter would be useful. For example, an open covered walkway might be a design solution. Better electronic signage announcing upcoming busses located under the blue shelter might help as well. Related, and not addressed directory in the published solution is that the current plaza puddle up in rain and snow. The solution should address this and slightly raise the walkway landscaping to encourage drainage. A related helpful solution would be to heat the walkway path in winter to melt the snow along the desired path. These surfaced issues and potential solution address the intention and use of the transit stop and reflect, at least my own “action research” of using and observing use of the stop. While the design solution might well afford positive aesthetics, I believe a real putting people first solution affords their functional requirements. Danny: The 56/Milwaukee bus route once passed through the station in some manner. I don’t recall how, and I don’t know why it was changed. Under that former configuration, the canopy worked fine for passengers waiting for both bus routes. You’ll find in today’s post that we propose bus tracker signage. With that, 56/Milwaukee passengers could also wait under that canopy until their bus is approaching. There are ideas that don’t lend themselves to plan or rendering view. For example, additional signage underground that would assist the non-regular commuter. My error above. I said 87 Montrose bus when I meant 76 Diversey bus. Brain freeze, but the points I made were for the Diversey bus. 1. Accent lighting is nice, but what is the point? I (a 225 pound male) do not feel very secure at the stop late a night waiting for the 56 bus. My wife refuses to use the stop. More than accent lights, will placed lighting on commuter waiting areas and readily apparent security cameras may make the stop more inviting. 2. I disagree with the sentiment that this stop should become a destination location for the area. Of course it depends which locals choose to habituate there, but there is the risk that making it a destination make the stop less safe for commuters. At the very least, this should be explicitly studied, not merely assumed to be desireable. 3. It is true that only two 76 routes use the turn around today. This is due to the recent CTA budget cuts. If the lanes were reduced to supporting only two busses, wouldn’t matters be complicated should a third or fourth route use the turnaround in future years? Shouldn’t this study inquire what CTA’s long term plans are for the stop? Shouldn’t the solution, unless the CTA is certain there never will be more than two routes using it in the future, support return to previous service levels? The station is done by famed Harry Weese. The design later led to the design of Washington DC’s Metro. There are a lot of elements in the plaza area. 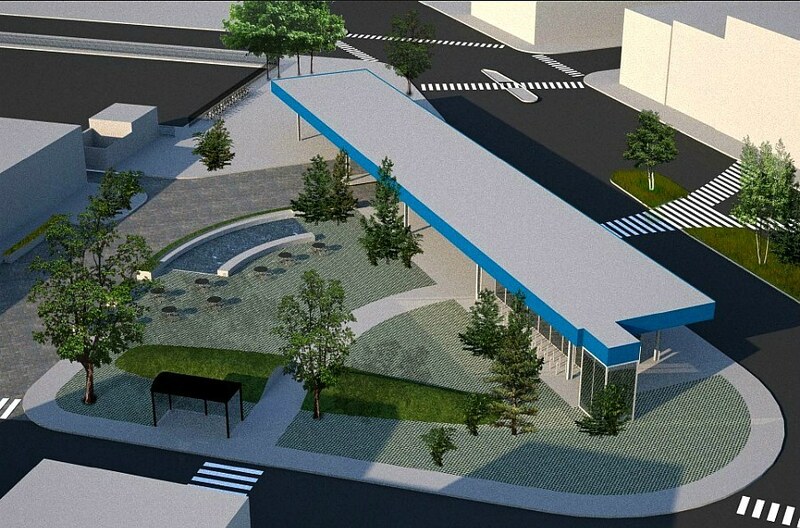 The mid-century/modern design of the station needs a plaza design that respects its design. These unorganized ideas and thoughts just make the plaza a mess. It needs to be more orthogonal design elements. I disagree with both comments/conclusions above. For starters, having more people using the plaza will absolutely make the area more safe. Perhaps you don’t remember what the Loop was like in the 80s, when as soon as the quitting bell rang the whole area was deserted by the working folks and taken over by street people. More eyes on the street = more safety. I weigh 170 lbs. and I use that stop/walk through the area at all hours and have never had a problem. Cameras are a joke – they record crime, they don’t prevent it. If they worked, the safest areas in the city would be the high-crime areas riddled with the blue-light cameras, but we all know that’s not what has happened. As for the CTA’s “long term plans,” the CTA has gone limping to Springfield annually for years just to beg for funding to stave off service cuts. They’re not capable of any long-term strategic planning when they can’t even count on keeping their operations at current levels. The better question is what is really gained by having the 76 Diversey bus disrupt existing traffic flow just so people don’t have a 90 second walk to the station. Watch the chaos on Diversey & Kedzie when the 76 tries to make that tight turn during rush hour, it’s an urban planning fiasco. Carter: I definitely think more “eyes on the street” will increase, not hinder safety in the area. I, too, feel safe here, but I also know that different people have different expectations and experiences of places. There is generally a difference, for example, in how women and men experience a place. Some of it may be what users are familiar and comfortable with. 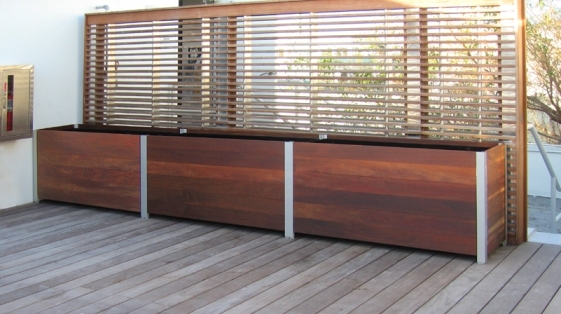 It’s possible for the design to help or hinder how safe people feel in the space. Looks wonderful! But can we maybe have picnic-tables? Or benches, or some sort of general seating? Under a tree?? Sometimes I like to go sit there and read or knit. But all of the bums hang out there too. And I’m guessing they’ll take dibs on your one table! Maybe I should just walk one block further, and sit in the grass near the sculpture with all the other kids. But there’s always so many people there, sitting in the grass. It might be nice to have a bench/table in the shade there too. Nevermind, sorry. I just saw in the picture that those dots are tables. Are they permanent?? Because that might be risky..
Mariel: Yes, we’d like to see seating, even better if it’s moveable. And yes to a shade tree or two, although we have to see what the structure will support given the tunnel beneath. This is a wonderful start! I would like to see this in context of the overall Logan Square Scheme. It would also be good to consider the sad fate of Paseo Prairie Garden across the street, which is now a hang out for undesirables morning, noon and night What would prevent the same thing from happening in the new space?